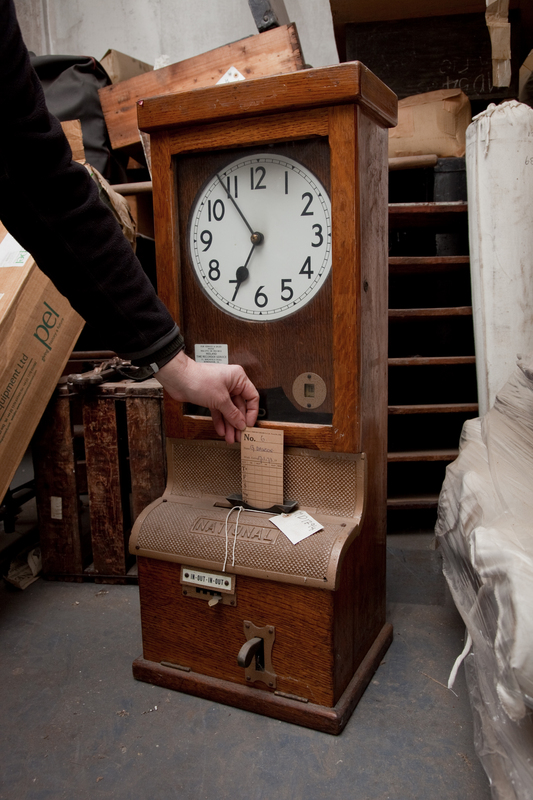 The visual trigger for our Creative Writing group a couple of weeks back was an old factory clocking in machine. We were asked to use it as a trigger for a short story. In his left hand the man held a clipboard with the latest list. The walking stick, in his right hand, steadied him. His frame, slightly bent with age, walked along the corridor. His once grand robe, faded and greyed hung loose around him. Looking too large for its owner, it dragged along the corridor floor gathering dust. The old man was thinking about his need to find an apprentice. It was becoming urgent. The number of entries under his Guardianship was increasing. The lists were getting longer. It was definitely too much for him to do alone. Errors might begin slip in and that could not, would not, be tolerated. There would be no putting it off any longer. He’d have to find an apprentice and train him up. However, a job in the Bilbliotecus was not a job for everyone – It demanded a high level of responsibility, requiring total dedication to long hours of monotonous work necessitating total accuracy and attention to detail. He sighed, stopped and studied the list. It was another long one. As he scratched at his beard, his eyes settled on the first entry, James McNaughton, before making his way through the Catalogue Hall to the Stack for Ms.
Once there, his first task was to find the corresponding key card. He flicked through the catalogue, Mc, McN, McNa….McNaughton….McNaughton, James. He crossed checked the man’s date of birth to ensure he had the correct one. 28th November 1935. “Ah a long lifetime” he thought. He took James McNaughton’s key card and placed it on the large key ring he carried attached to his belt and ticked him off his list. Next on the list was Sue Petersen, Date of Birth 1st February 2014. The first of the children. These always made him sad. The long walk from M to P gave him time to ponder this. Too much time. Her key found, it was added to the ring and ticked off the list. So his work progressed until one hundred keys were so acquired and each one ticked off his list in due order. His key ring was now full and quite heavy. He left the Stack and headed over to the Hall of the Great Timekeeper, the first of many such trips he would make during this work cycle. At the Hall’s doorway, he paused, put his walking stick over the arm holding the clipboard, placed his right hand against the gigantic door and waited. A moment later a slight tingle flooded through his right arm and not long after that the door swung open. The Hall’s lights activated automatically. Even now after all these years, this still shocked his eyes, used as they were to the dark Stacks. Allowing them to adjust before proceeding, he heard the Great Timekeeper welcomed him. “Guardian Cronus, welcome. Please approach”. He walked across the room, slowly, under the weight of the full ring and sat down in front of the great machine. Taking his key ring off his belt and laying it on the desktop, he began the next stage of his work. The same sequence as used in their acquisition was followed for their processing. He removed James McNaughton’s key card from the ring and placed it into the main slot of the Great Timekeeper. The machine blue hue intensified, it muttered some mechanical clicks and motioned its workings into action. McNaughton’s key card disappeared from view to be returned a few moments later marked with a seal, dated and time stamped. Meanwhile, the old man had taken a second key ring from his belt and had laid it down on the opposite side of his work area. He transferred the sealed key card onto this second ring, taking great care not to break the seal. Sue Petersen’s key was next, and with what might have been thought to be water in his eyes, put her key in the slot. Not for a moment did he consider not doing it. Once, early on in his career in the Bilbliotecus, he’d done exactly that with terrible consequences, both for him, but more worryingly for the soul in question. He’d never done it again. The pain, the noise, the darkness. It had all been too much. He knew he never wanted to repeat that experience, never. So he continued his work, till all 100 keys were processed and transferred into the second key ring. He loaded the two key rings back onto his belt, stiffly raised himself from his work console, and began to walk back the way he’d come towards the doorway. “Goodbye Guardian Cronus” said the Great Timekeeper softly as the old man saw the heavy doors open for him to leave. He crossed the corridor and entered a second great Catalogue Hall and systematically filed the sealed keys therein. All his re-filing finished, he gathered up his two key rings, now empty and lighter, and attached them back to his belt. He signed off his list as complete, removed it from his clipboard and placed it in the Work Done tray. As he turned and left the second great Catalogue Hall, he felt his burden of responsibility lightened for his return journey, enabling him to turn his thoughts back to his search for his apprentice. The door swung closed, once more sealing behind him the Book of the Dead as he set forth back along the corridors in the direction of the Catalogue of the Living to pick up his second list of his work cycle.